FitFlop has teamed up with Michelle Stein, President of AEFFE Group, to introduce the limited edition Loosh Luxe collection, including slides and sandals that blend style and comfort technology for the ultimate fashion forward shoe. The idea for the partnership started after an organic experience Michelle had with FitFlop. She shares, “I tried on my first FitFlop sandal at Corso Como last summer and was astounded by the comfort and style of these sandals. I never wanted to take them off. After much research, I approached the London-based company with a proposal to develop a unique luxury collection.” From an experience to a reality, FitFlop’s Limited Edition Loosh Luxe collection will initially be available exclusively at Barneys starting November 1. Following this launch, the collection will roll out to additional retailers as well as www.FitFlop.com. The Loosh Luxe collection – a playful take on the current athleisure trend – is crafted using high-end Italian materials, which deliver an elevated and chic touch for which AEFFE is known. Coupled with FitFlop’s Microwobbleboard™ midsole, a biomechanically engineered base that uses targeted cushioning throughout various sections of the footstep, the collection is both fashionable and functional. 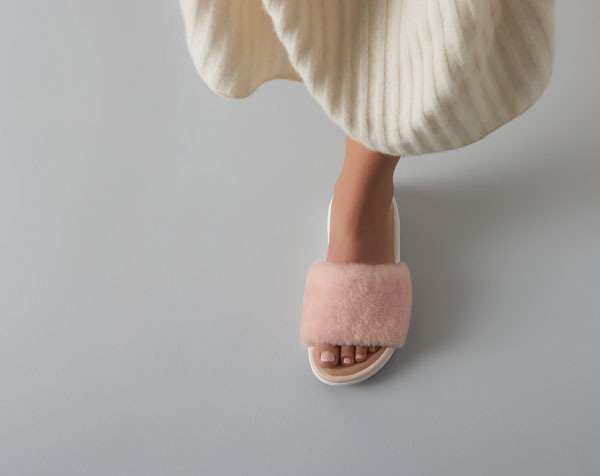 This elevated collection opens a new luxury channel for FitFlop with more chic designs and styles from AEFFE Group and Michelle Stein to come. For more information about FitFlop, please visit us at www.FitFlop.com or follow us on Instagram. In 2007 Marcia Kilgore, serial entrepreneur and award-winning businesswoman, founded FitFlop, bringing her first biomechanically engineered sandals to thousands of comfort-seeking women around the world. With a decade in the footwear industry, FitFlop has broadened its range to now include shoes for a variety of all-year- round wearing occasions and has introduced a global brand campaign, “FOR SUPERWOMEN,” featuring the iconic actress, Uma Thurman. Celebrating how women juggle many different roles every single day, heroically and without fuss, FitFlop supports them from the ground up to both look and feel good.